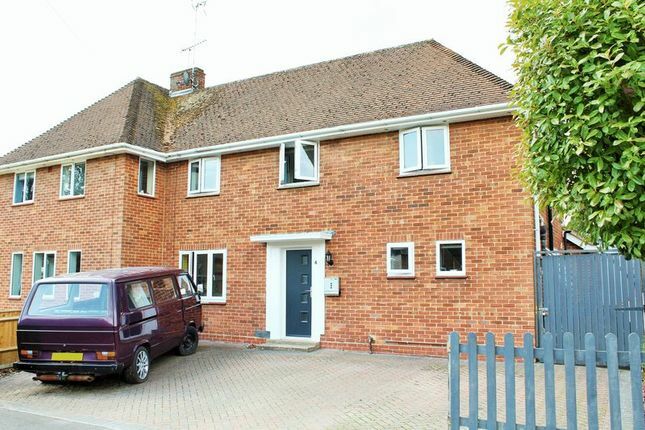 An opportunity arises to purchase this semi-detached family home situated in a popular residential development within Hythe. This property is set on a large plot and proudly presents an extensive well maintained rear garden, very good sized accommodation throughout including a lounge, separate dining room, extended kitchen/diner and W/C. Upstairs consists of three generously proportioned bedrooms and a family bathroom. Further benefits include a large driveway and newly fitted double glazing. Please call Enfields Hythe on to arrange a viewing. Double glazed front door. Wooden flooring. Two double glazed windows to front aspect. Radiator. Access to W/C. Stairs leading to first floor with under stairs storage. Double glazed sliding doors leading to rear garden. Radiator. Double glazed window to front aspect. Open fireplace. Spotlights. Double glazed window to rear aspect. Wooden flooring. Radiator. Archway leading to kitchen. A range of wall, base and drawer roll top units. Tile flooring. Double glazed windows to side and rear aspect. Double glazed french doors leading to rear garden. Skimmed ceiling. Spotlights. Integrated cooker and oven. Integrated dishwasher and washing machine. Radiator. Boiler. Tile splash back. Double glazed window to side aspect. Tile flooring. Sink. Low level W/C. Skimmed ceiling. Radiator. Two double glazed windows to front aspect. Access to loft. Double glazed windows to front and rear aspect. Wooden flooring. Spotlights. Radiator. Double glazed window to rear aspect. Wooden flooring. Skimmed ceiling. Radiator. Double glazed window to rear aspect. Skimmed ceiling. Radiator. Double glazed windows to front and side aspect. Laminate flooring. Bath with shower over. Low level W/C. Pedestal sink. Tile walls. Skimmed ceiling. Heated towel rail. Block paved Driveway. Outside lighting. Access to rear garden. Enclosed and offering a sunny south westerly aspect. Laid to lawn. Large patio seating area. Gated side access. Garden shed. Outside lighting. Outside water tap. Small tree and hedgerows. New Forest District Council Tax Band B.
Waterside Primary School - Noadswood School. Depart Pylewell Road toward The Marsh. Bear right onto The Marsh. Turn left onto St Johns Street. Road name changes to South Street. Turn left onto Langdown Road. Turn left onto Tates Road. To be approved by vendor.